Cincinnati COOKS! is a free job training program. During the 10-week course, you will learn the mechanics of a commercial kitchen, as well as professional and life skills to ensure success in the food service industry. Course topics include: food safety, food inventory and storage, and basic nutrition and knife skills. 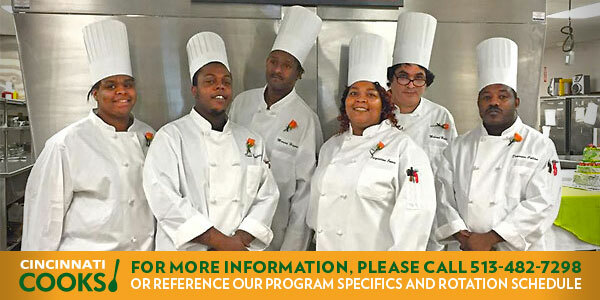 All classes take place at the Rosenthal Community Kitchen, located inside the Jeff and Darlene Anderson Family Building at 1141 Central Parkway, Cincinnati, Ohio 45202. As a Cincinnati COOKS! 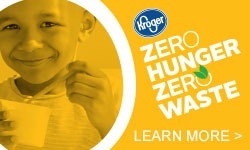 student, you will also make a difference in the lives of hungry children. Most of the snacks and meals you prepare during training are served at Kids Cafe, our after-school feeding program for school-age children. 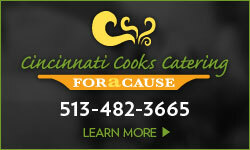 With the support of Cincinnati COOKS! students, we are able to provide up to 3,750 Kids Cafe meals each week at more than a dozen school sites. Following graduation from Cincinnati COOKS!, you may enroll in our Second Course advanced program. The eight-week course provides higher skills training for management opportunities and employment in fine dining restaurants. After completing both Cincinnati COOKS! and Second Course, you can further your education at Cincinnati State, transferring credits toward earning an Associate Degree in Culinary Management through the College of Business Technology. Classes take place from 8:00 a.m. to 3:00 p.m. Monday through Friday. A new class starts every five weeks. Please see the rotation schedule and fill out online application or print application. You may also pick up an application packet at any time from the information kiosk outside the Rosenthal Kitchen, 1141 Central Parkway. Logistics, Inventory Management, Facilities Management and Transportation (LIFT) offers an opportunity for unemployed and underemployed adults throughout the TriState region to become trained in a growing field, providing essential job skills. 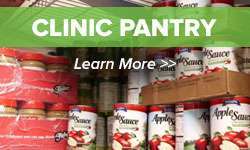 This 10-week free job training program based in Northern Kentucky will supply hands-on training from experienced warehouse personnel at the Freestore Foodbank, specialized coursework designed by Gateway Community and Technical College and soft skills support from the Life Learning Center, as well as links to local employment through BelFlex Staffing Network and other program partners. Applications will be accepted this summer.